Military | Kingwood TEA Party, Inc.
1. We honor their memory and Memorials. We don’t let “them” tear them down. 2. We take every opportunity to thank them for their Service. 3. We pray for each and every one of our Veterans and active Military. 4. We vote for Liberty and what’s right. May God bless each of you and your loved ones, and may we never forget our Honored Fallen. Move HISD Elections to November! 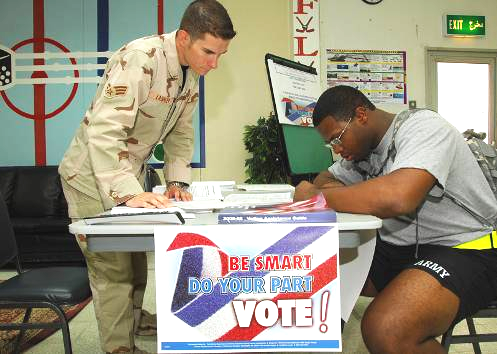 Let our active Military members from Atascocita, Humble and Kingwood vote in HISD elections. Humble ISD School Board Mtg. Tuesday, Dec. 13, 2011; 7 p.m.
Our soldiers, sailors & airmen serving overseas regularly risk their lives for us, yet they are effectively denied their right to vote in our area because Humble ISD has chosen to continue holding their elections in May instead of with the normal November primary election. This creates a significant barrier to Active Duty and deployed Reservists from participating in the democratic process. In fact, in the last 10 years only one Military voter from Atascocita, Humble & Kingwood has requested an Humble ISD absentee ballot while stationed overseas! The barrier created by a May election extends to all Humble ISD voters as well: a mere 2 percent of the 95,000 registered voters cast ballots in the recent May, 2011 election. The solution is simple: Were Humble ISD to hold elections in November, the Harris County Voting Clerk would simply include Humble ISD as part of the package sent to our military voters overseas. LAST CHANCE: Humble ISD only has until December 31 to inform the US Justice Department whether they will continue holding their elections in May, or if they will do the right thing by holding Humble ISD elections in November as nearly two-thirds of all Harris County school districts have done. Please tell Humble ISD Trustees that we should move HISD elections to November! Come to the last school board meeting of 2011 on Tuesday, December 13 at 7 pm at 20200 Eastway Village (next to Home Depot in Humble) and support our MILITARY VOTE. Our local military personnel: our sons, daughters, husbands, and wives deserve every opportunity to vote as they fight and defend America overseas. If you cannot attend the meeting, please contact the Trustees at www.humble.k12.tx.us and ask them to help our Military vote. MOVE HISD ELECTIONS TO NOVEMBER. Boehner bill v.3 or so, passes House. Boehner bill now up to version .3, includes a balanced budget provision. Senate will reject and try to stuff Reid’s deal down the House’s throat. Reid deal gives cover thru the ’12 election. Note from Robin: Rep. Poe and his chief of staff were in contact with us through both votes. Though Rep. Poe felt that we had to take an incremental approach here, he is convinced it sets the stage for full implementation when the People vote again and send help to the House & Senate. When two fine representative like the Judge and Colonel West see value in this incremental approach, I am willing to trust their judgment and continue to fight alongside him in this epic battle for the survival of our Nation! We are proud to move into the fray with a principled Statesman like Rep. Poe beside us. He IS listening and representing us well even when we disagree slightly on methodology. Thank you, Rep. Poe! By the way, Reid is giving us ObamaCare deja vu–cramming their terrible version down our throats. We need to let everyone know why it’s so bad for us. Join us in the messaging fight. Local video whiz who knows how to edit video and get it up on YouTube quickly is desperately needed. WASHINGTON — The Senate has confirmed the nomination of Marine Gen. James Mattis to serve as head of U.S. Central Command. A $10 billion teacher bailout bill that is on a fast track to congressional approval is paid for, in part, with a $3.3 billion cut in defense programs.